Not enough detail? Then click here for the extra-large version (caution – big file). 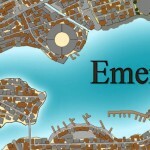 Emerisia is a densely-packed port city. Made with the Fantasy Cities Annual of Campaign Cartographer 3.